HCMC Public Passenger Transport Management Center will coordinate with Southern Aiport Transportation Joint Stock Company and Saigon Passenger Transport Joint Stock Company to open bus route No. 109 and 152 to transport passengers to and from Tan Son Nhat Airport free of charge. Director of the center Tran Chi Trung yesterday said the two free routes aim at reducing personal vehicles in the airport and traffic jam during peak travel time of the Lunar New Year festival. Passengers can travel free from 5a.m. to 10p.m. on February 10-14 and February 20-24. 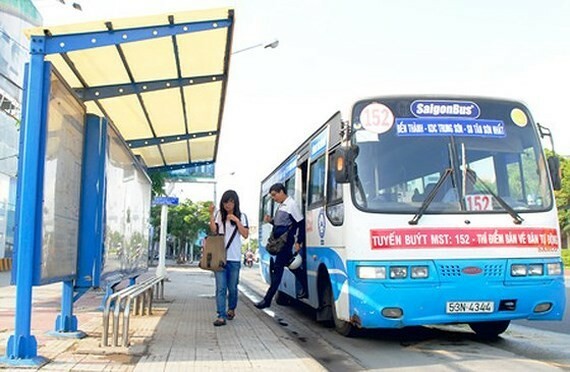 The center will increase trips in case of sudden travel demand hike during the Tet holiday, suggesting HCMC Transport Department to propose Tan Son Nhat Airport to exempt buses No. 109 and 152 from paying fee at the toll gate in the airport and permit to hang banners for passengers to be aware of the free bus service. Currently, subsidized route No 104 from Cho Lon to Ga Crossroads bus station and non-subsidized route No. 159 from Mien Dong to An Suong station travel through Truong Son Street in front of Tan Son Nhat airport. Still they have not directly connected with airport terminals.